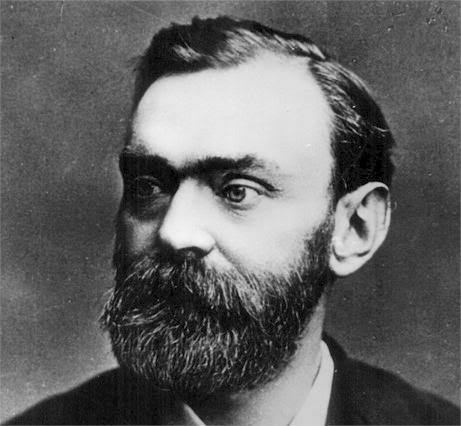 Alfred Bernhard Nobel (born in Stockholm, October 21, 1833 - died in begravningsplatsen Norra, Stockholm, December 10, 1896 at the age of 63 years) was a chemist, engineer, and a Swedish businessman who invented dynamite. In his will, he mewakafkan his property to create a Nobel Prize. Alfred was born on October 21, 1833 in Stockholm, Sweden. His father was Immanuel Nobel and his mother was Andriette Ahlsell Nobel. Alfred's father was an engineer and inventor; he built bridges, buildings, and experimenting with various ways in rock blasting. Alfred had two older brother, namely Robert (born 1829) and Ludvig (born 1831). In the same year as Alfred was born, his father lost business and closed. In 1837, Immanuel Nobel decided to try his luck elsewhere and moved to Finland and Russia. Alfred's mother stayed in Stockholm care for his family. Mrs. Alfred - who come from wealthy families - began to open a grocery store. From there he could support his family. Meanwhile, Nobel Imannuel business in St. Petersburg, Russia began to climb. It has opened a machine shop that supplies equipment to the Russian soldiers. He also made the Russian Tsar and his generals believed that sea mines can be used to repel enemy ships and attack St. Petersburg. The mines entered the Royal Navy to block the firing St. Petersburg during the Crimean War (1853-1856). Because success in Russia, is now able to move his family to Imannuel St. Petersburg (in 1842). In 1843, Andriette birth son named Emil. The son of Nobel receive education from a tutor. They accept a variety of subjects such as science, language, and literature. At age 17, Alfred and writes fluent in Swedish, Russian, French, English and German. Alfred was very interested in the fields of language, chemistry, and physics. His father wanted to follow in his footsteps and do not appreciate the talents of Alfred in the poem. He decided to send his son abroad to study and become a chemical engineer. In Paris, Alfred worked in the private laboratory of Professor TJ Pelouze, the famous chemist. There he met the Italian chemist, Ascanio Sobrero. After the first three years, Sobrero has discovered nitroglycerine, a liquid high explosive, which was considered too dangerous to use. Alfred became very interested in nitroglycerine and its use in construction work. When he returned to Russia after his studies, he worked with his father to develop nitroglycerine as an explosive that is commercially and technically useful. After the Crimean War ended, a business retreat Alfred's father and he decided to return to Sweden. Both brothers Alfred, Robert and Ludvig, stayed in Russia to try to manage his family business legacy. And they succeed and continue to develop the oil industry in southern Russia. Upon their return to Sweden 1863 Nobel family, Alfred focused developing nitroglycerine as an explosive. Unfortunately, this experiment led to the disaster that killed several people including his brother, Emil. The Swedish government decided to ban this experiment in the city limits of Stockholm. Alfred did not stop and continued experimenting on a barge on Lake Mälaren. In 1864, he was able to start the mass manufacturing of nitroglycerin, but he never stopped experimenting with various additives to secure production. Alfred discovered - through experiments - that mixture of nitroglycerine with kieselguhr fine soil will turn the liquid into a paste that can be molded into rods, which are then inserted in the borehole. This discovery occurred in 1866. Alfred obtain a patent on this material next year. He called it dynamite. He also found a detonator or blasting plugs that can be turned on with the light axis. This discovery was made while wearing the crown of the diamond drill and drill the wind began to be used in general. Used together, these discoveries help to reduce the loss of a lot of construction work such as drilling line, rock blasting, construction of bridges, and so on. Dynamite and detonator plugs behavior in the construction industry. Because of this, Alfred could build factories in 90 different places. He lives in Paris but often travel to plants in more than 20 countries. He has been described as "Europe's richest vagabond". He worked intensively on the San Remo (Italy), Hamburg (Germany), Ardeer (Scotland), and Sevran Paris (France), Karlskoga and Stockholm (Sweden). He also tried to make rubber and synthetic leather and artificial silk. In addition, he also made gelatin, balistit, imitation precious stones, and others. Until his death in 1896, he has received 355 patents. Alfred was married. One day, he announced in the paper to hire a secretary. Austria-Hungary the lady Bertha Kinsky von und Tettau Chinic took the job. After working for a short time, he returned to Austria to marry Prince Arthur von Suttner. Alfred and Bertha Sophie Felicitas von Suttner became friends Baronin fixed and corresponded for years. Berthapun active in peace movements. He wrote the book Throw out your gun. When writing his will to establish the Nobel Prizes, Alfred Nobel prizes to include individuals or entities that promote peace. Alfred died in San Remo, Italy on December 10, 1896. In a letter of his last will and testament, he wrote that much of his fortune be used to give a gift to humanity that has been doing business in the fields of physics, chemistry, literature, peace, physiology and medicine. Not everyone likes this. His relatives contested the will and questioned the authorities in several countries, and take four years for the parole officer to convince all parties to meet the expectations of Alfred. In 1901, the first Nobel prize in physics, chemistry, literature, physiology and medicine were distributed in Stockholm, Sweden and the Nobel Peace Prize in Kristiania (now Oslo), Norway.